Heart-shaped flower buds ready to open. This is also my next entry in Becky’s ‘In the Pink’ Square in September photo challenge. And yet, I did just that, walked away from it when Dean and I sold our home and moved into an apartment in a highrise complex back in 2012. I sold what pot plants I could and then gave the rest to my neighbour. She was delighted beyond words. The only plant I kept was my Chain of Hearts, a dear gift from a friend more than 20 years earlier, and a treasure I could NOT part with under any circumstances. It would be another nine months before we moved into our new home and more than two months before we had fencing to separate our property from our neighbours, but once this was accomplished, so began a new odyssey – reintroducing myself the wonderful world of gardening and growing plants. They started coming in thick and fast – from old friends and new friends and, much to my surprise, from family. My sister, who lives in Brisbane gifted me some lovely little pots containing various succulents, and then my cousin Leonie said, “Come over and take whatever you want!” Sadly at that time, my Aunty Pat, her mother, had recently passed away and Leonie was in charge of ‘renovating’ Aunty Pat’s house. This included the almost inconceivable task of tidying up the garden. Aunty Pay love plants and gardening so much. She had everything, everywhere. It was a jungle, or as near to jungle like that a garden can be in the midst of suburbia, and Leonie made the offer because she knew our new home came sans landscaping, so Dean and I filled the car with plants. Some were cuttings, some came with their own pots, others were carefully dug up and placed in pots we arrived with. Three times we did this and, although I can admit a few plants didn’t survive being transplanted, most did and are either thriving in my garden or flourishing in their new pots. One such plant was a cutting from the biggest Begonia I have ever seen and Leonie told me it originally belonged to my Grandfather. I had no idea my Grandfather grew Begonias. I was only 15 when he passed away, so I’m guessing there are many, many things I never got to know about him, however, it makes my heart glad that I have a plant in my garden – two actually – that are ‘grandchildren’ of the original plants he owned. 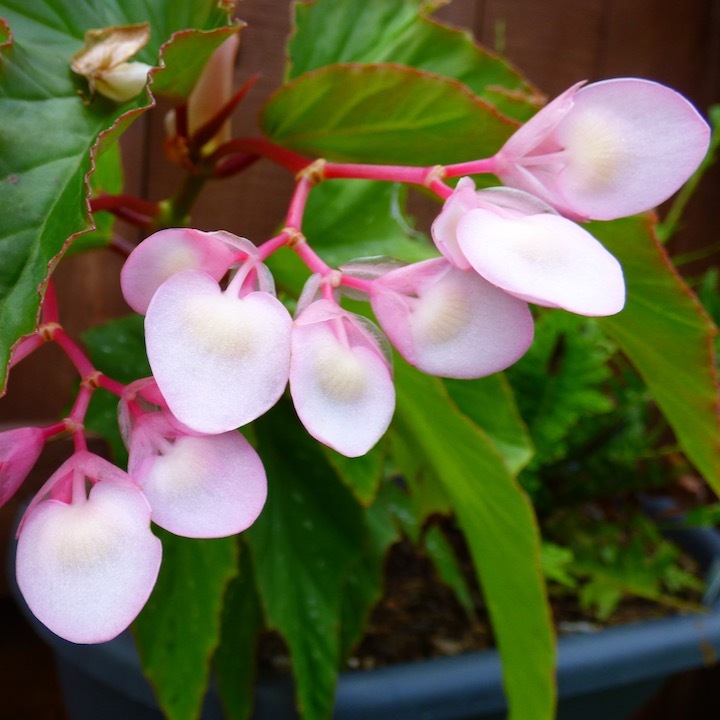 Leonie called it a Tree Begonia, but my research has revealed it is a variety that belongs to the Canes group, often called ‘Angel wings’ (see Begonia – Part 1) and has the most gorgeous deep green, wing-shaped leaves and (when in bloom) masses of clustered pink flowers. It’s not in flower at the moment, my square photo above was taken in January (2018) and is of a cutting I placed in a smaller pot. This Begonia is sun-hardened and almost as tall as I am and it has a very important job – hiding our gas bottles. When the delivery man arrived with a full bottle recently he said, “Wow lady, that plant’s amazing.” I just smiled and stood there making sure it wasn’t in harm’s way. But I can see why my cousin called it ‘Tree Begonia’ and I’m curious to see just how tall it will get. See those ‘snow’ like markings on the leaves. These are very predominant on this one. 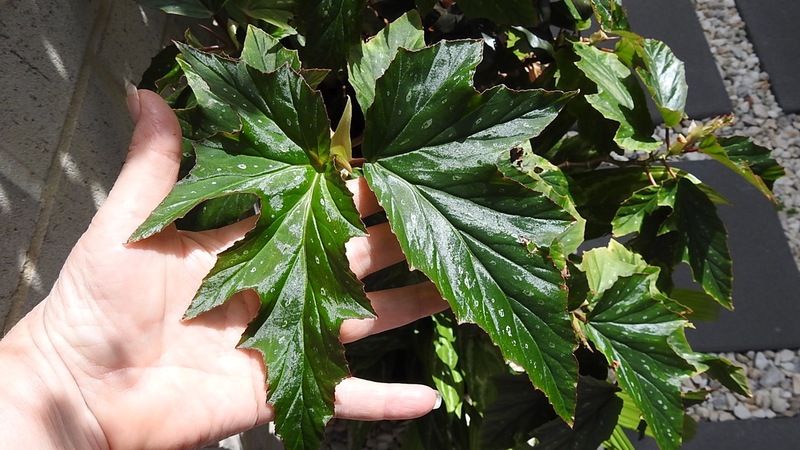 The other cane Begonia I have has paler leaves, white flowers and, while I always thought the markings appeared on the leaves as they age, I’m now questioning whether or not I have two white varieties in the same pot – one with markings, and one without. This will require a little further investigating next time I’m in the garden. Do you have any plants that have special meaning for you? I think of my Grandfather every time I give these Begonias water. I think of my Aunty Pat as well and of the generosity of my cousin Leonie to allow Dean and I to ‘acquire’ some plants for our new home. I’ve no doubt my garden wouldn’t look as good as it does without her act of kindness. I have a crimson zygo cactus that is from John’s mother’s garden, it flowers each year on her birthday, it is beginning to look very old actually but is beginning it’s ritual prior to blooming at the end of next month. My father’s hearty hostas thrive on in my garden today and comfort me with fond memories of my childhood home.